The product we offer is Oil Storage Tanks, which is the best as this is quality tested under the stringent guidelines of our quality analysts. These Horizontal / vertical bulk oil storage tanks with MS Plates conforming IS T02 grade B-2062 SS, are fabricated using high grade raw materials. Made as per IS- 803 & welded joints are tested for leak proof by water pressure. 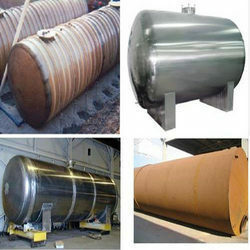 These portable tanks used in substations in transportation and storage during the filtration process.